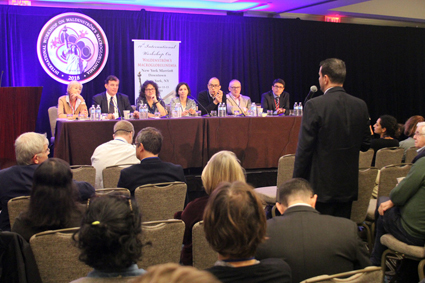 The 10th International Workshop for Waldenstrom's Macroglobulinemia was held from October 11th through the 13th, 2018 in New York City. The venue chosen for this meeting is one of New York City’s premier hotels, the New York Marriott Downtown Hotel and Conference center, situated in Lower Manhattan near Battery Park. The hotel nestles in one of the city’s most historic areas near Wall Street, the 9/11 Memorial Museum and One World Observatory. Onsite registration and check-in began at 12:00 on Wednesday, October 10th, conference sessions starting on Thursday, the 11th, at 7:30am. Overall, IWWM-10 included 16 sessions with 73 technical presentations including a Junior Investigator Poster presentation event with 5 short oral presentations, 79 WM-related posters, 8 "Keynote" lectures, Opening and Closing Ceremonies with associated award presentations, a Faculty Reception, 5 panel discussions on treatment approaches to WM, and 3 consensus panel discussions. 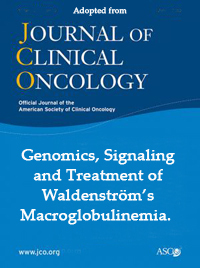 The Waldenstrom's Macroglobulinemia Clinic at the DFCI is devoted to the care of patients with Waldenstrom's Macroglobulinemia and related IgM disorders, including IgM MGUS, Myeloma and Neuropathies. For more information on the WM Clinic at DFCI, please visit the DFCI Center for Hematologic-Oncology/Waldenstrom's Macroglobulinemia Clinic.